Marian Kaldas holds a BA in Business Administration from the American University in Cairo, Egypt. She also holds an LL.B. from the faculty of Law, Cairo University and an LL.M. from the Robert H. McKinney school of Law, Indiana University, USA. Marian Kaldas is a PhD. Candidate at the faculty of Law University of Montreal. She works under the supervision of Professor Violaine Lemay. She is the co-editor in chief of the scientific review “Les Chantiers de la Recherche en Droit” Vol#3. 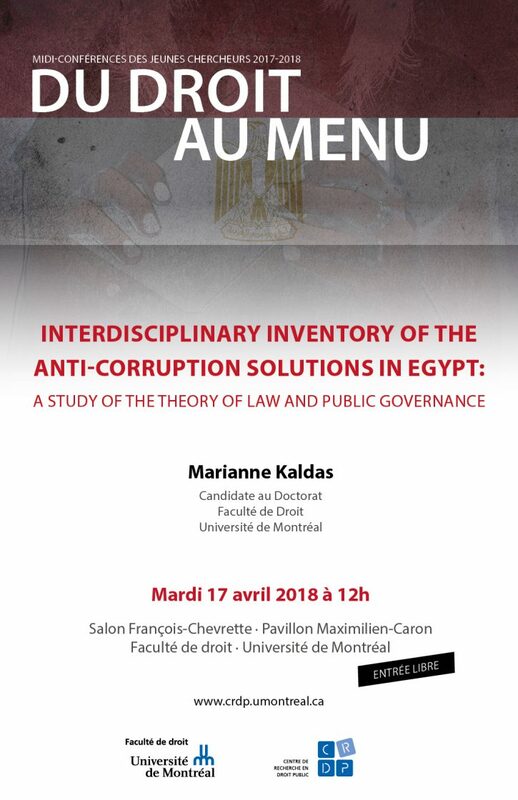 Her research interests focuses on finding adequate legal measures to curb corruption in emerging countries like Egypt while taking into consideration the country’s geopolitical, and socio-political context. Ce contenu a été mis à jour le 6 avril 2018 à 10 h 52 min.